Our daughter has a rare neurological disorder called Rett syndrome. It affects just about everything. Rett has robbed her of the abilities to walk, talk and use her hands. But she understands everything, she is very smart. She communicates with her eyes. She is almost 6 and has yet to walk independently or utter a word. She is wheelchair bound and depends on us for everything from feeding, drinking, changing, sitting on the potty, wiping away an eyelash, and everything in between. Last summer, Cammy began the IGF-1 clinical trial in Boston. We knew this was going to be a big emotional, physical, financial stress on our family, but we are determined to give our daughter the best future possible. Over a year and a half, we would travel from Wheaton, IL to Boston 6 times for a total of 60 days. Leaving our home and comforts for so long for tests, appointments and injections was daunting, but we have so many people to thank for Cammy’s flawless first flight. Thank you Children’s Flight of Hope of providing round trip flights for Cammy and I to fly to Boston to participate in the IGF-1 clinical trial. All the families like mine appreciate organizations like yours who realize the financial strains of participating in clinical trials or flying all over to find treatment for your child. 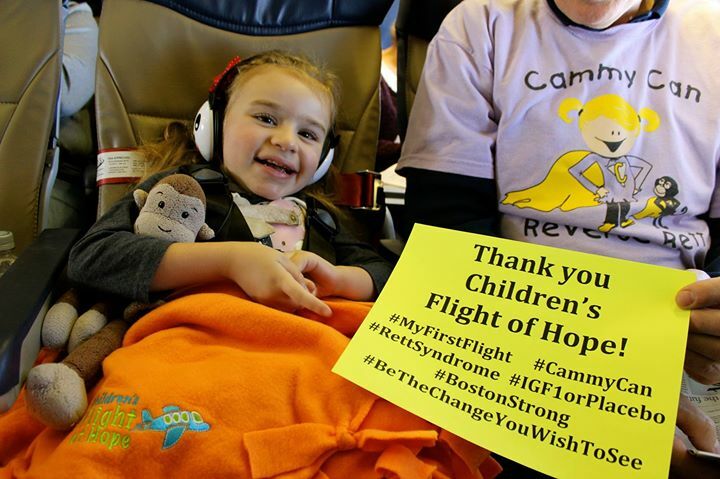 CFOH has continued to fly Cammy and her mom to and from Boston Children’s Hospital along with two other Rett families. These families would have to turn down the opportunity for this trial if it were not for CFOH’s commitment to providing assistance for as long as treatment dictates. We are truly a part of not only Cammy’s future but the future of so many others who will be impacted by advancements made in clinical trials.